If you’ve been accused of criminal wrongdoing, whether it’s a simple traffic infraction or murder, hiring the right criminal defense lawyer is the first step to getting your life back in order. At TATE BYWATER, we’ve defended thousands of defendants over the years and have an excellent track record of helping people avoid the worst punishment. What can the right criminal defense attorney do for you? Avoid jail / reduced prison time: If you have to spend time in jail or prison, every day is a day of your life lost. It’s important to find a criminal defense lawyer who will fight tooth and nail to avoid or reduce any time you spend incarcerated, or to defend you so well that all charges are dropped. It’s always our goal to make sure that you retain your freedom. Help get reduced fines: Fines can range from simple traffic tickets to court orders for millions in restitution handed down. Sometimes fines can be negotiated, or eliminated completely if you’re found not guilty during a trial. Losing your job or security clearance: People are not always aware of the collateral consequences of a criminal conviction. Having the right defense lawyer fight your case and explain the consequences is crucial. Losing your privilege to drive: In many driving offenses the court or the Department of Motor Vehicles can suspend your license. Before you go in to court you need to be aware that you could lose your right to drive — a good lawyer will do everything they can to avoid this. We know how important it is for you to be able to drive. Reduced stress: A court case is just about the most stressful situation a person can go through. But imagine how many gray hairs you can avoid if you have complete confidence in your criminal attorney. Work with us and you will have that confidence in each of our defense attorneys in our law firm. We can’t guarantee that we can get you out of every problem, but we will do our best to mitigate the worst of the punishment. 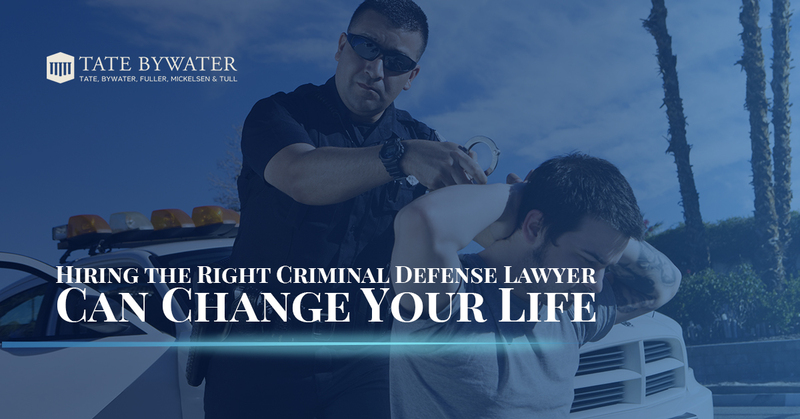 Contact TATE BYWATER when you want a law firm with criminal defense lawyers to protect your rights to the full extent of the law.